The Afghan National Army (ANA) falls under the control of the Ministry of Defense (MoD). At present (Feb 2012) there are about 176,000 members of the ANA. One of the biggest challenges for the MoD and the ANA is that of sustaining the Army in equipment, supplies, food, fuel, food, ammunition, tactical infrastructure, and maintenance processes. January 11, 2017. Combined Security Transition Command - Afghanistan Improved Controls Over U.S.-Funded Ministry of Defense Fuel Contracts, but Further Improvements are Needed, Department of Defense Inspector General Report DODIG-2017-041. July 2016, Afghan National Army: DOD Has Taken Steps to Remedy Poor Management of Vehicle Maintenance Program, Special Inspector General for Afghanistan Reconstruction (SIGAR), SIGAR 16-49 Audit Report. March 3, 2016. "The Coalition, Scarcity and the Afghan Army Logistics System", by Philip Lere, Small Arms Journal. An examination of the "Push" vs "Pull". December 19, 2014. "Assessment of U.S. Government and Coalition Efforts to Develop the Logistics Sustainment Capability of the Afghan National Army", Department of Defense Inspector General (DoDIG), Report No. DODIG-2015-047. View the Adobe Acrobat PDF report here on the DoDIG website. October 30, 2012. "Afghan National Security Forces Facilities: Concerns with Funding Oversight, and Sustainability for Operation and Maintenance". Special Inspector General for Afghanistan Reconstruction (SIGAR), SIGAR Audit 13-1, O&M Contracts for ANSF Facilities. This SIGAR report states that the "Afghan government will likely be incapable of fully sustaining ANSF facilities after the transition in 2014 and the expected decrease in U.S. and coalition support". View the Adobe Acrobat PDF report here on the SIGAR website. An Afghan firm - Alpha Omega Services (AOS) - was contracted to provide training, maintenance and repair services to the ANA throughout Afghanistan. The current status of the contract is unknown; but it likely is being terminated in early 2014. 2. The ANA has had a lot of problems maintaining their equipment and the track record for maintenance issues has been very spotty. 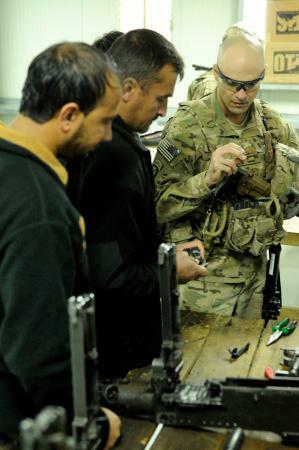 In the photo to the right MAJ Kyle Brown inspects a broken weapons part in the 201st Corps weapons repair shop. (Photo by SGT Eric Provost, Task Force Patriot PAO). "Push" vs. "Pull". The Afghan National Army logistics system received a lot of training from the Soviets over a long period of time. This resulted in a "Soviet style" logistic mentality of "pushing" equipment, material, ammunition, and supplies under a centralized plan versus "pulling" equipment, material, and supplies based on individual unit or operational requirements. The U.S., with its Coalition partners, attempted to institute a "pull" system - and the results have been less than satisfactory. Illiteracy, lack of an Internet, inadequate computer resources, a hoarding mentality, and an ill-trained Army led to innumerable problems. On top of that, those that did know logistics favored the "push" system. Of course, the problems associated with corruption permeate the activities of logistics, maintenance and supply at all levels. December 26, 2016. "Demilitarization program re-equips Afghan Forces", DVIDS. December 27, 2014. "Uh-oh in Afghanistan". By David Wood, The Blog - Huff Post Politics. Wood describes the inability of the Afghan National Army to manage its logistical system and places blame on ISAF and the United States advisory effort. December 11, 2014. "Departing U.S. general says Afghan forces 'inept' at basic motor repairs". Reuters. March 7, 2014. "Afghan police members graduate from property management course". DVIDS. Members of the RC South ANP Regional Logistics Center recently graduated from a 2-week property management course at the Joint Regional Afghan Police Center. February 2, 2014. "Sustainment and mobility: Afghans train on logistics for continued success". DVIDS. 5th Combat Service Support Kandak receives training. January 24, 2014. "ANSF and ISAF work logistics for upcoming elections". DVIDS. RC South SFAATs conduct training to ANA brigade supply teams on how to implement a more effective receiving and distributing system of class IX supplies. October 28, 2013. "Logistics efforts integrate with ANA development". DVIDS. News article on JTF Sapper J4 (Theater Engineer Brigade) participating in key leader engagements with ANA officers to help solve issues related to the 209th Corps Engineer Kandak and the ANA Engineer School House. September 5, 2013. "4th Brigade, 203rd Corps assumes contracting, maintains facilities". DVIDS. GSU at FOB Maiwand in Logar province develops capability with help from SFAAT advisors. September 3, 2013. "Afghan logistic operations gain traction in RC-East". DVIDS. News story about the Regional Logistics Support Command East (RLSC) located at FOB Gamberi. August 27, 2013. "Vanguard mechanics help ANA repair vehicles, increase combat power". DVIDS. U.S. Soldiers assist 2nd Kandak, 4th Brigade, 203rd Corps at FOB Airborne. July 7, 2013. "Army leaders walk a fine line in trying to teach Afghan soldiers to rely on themselves". Fayetteville Observer. LTC Matthew Stader, team leader for an SFAAT, discusses the challenges of advising the ANA on logistics. March 10, 2013. "The supply and demand of war: Logistics Conference". DVIDS. January 18, 2013. "U.S. paid to maintain inoperable Afghan vehicles, audit finds". The Washington Post. The news article states that SIGAR cites accountability problems with the Automotive Management Services (AMS) contract. November 9, 2012. "At Afghan outposts, donkeys step in as US helicopters pull out". The Independent. November 2, 2012. "NTM-A mentors, Afghan partners attend logistics development conference". DVIDS. November 1, 2012. "Report: Afghan Security Forces Face Infrastructure Challenges". American Forces Press Service. May 9, 2011. "Afghan National Army update, May 2011". The Long War Journal. April 7, 2013. Security Force Assistance Advisor Team Combat Service Support interview. DVIDS. An advisor on an SFAAT talks about his job advising 5th Combat Service Support Kandak (CSSK), 2nd Brigade, 215th Corps in Helmand province. 1. Afghan National Security Forces (ANSF): Training and Development. ISAF Media Backgrounder. February 2012. Provides info on current state of the ANSF as of February 2012. Adobe PDF file available here. 2. For more on the Alpha Omega Services weapons maintenance contract read "The Missing Part", DVIDS, January 8, 2014.